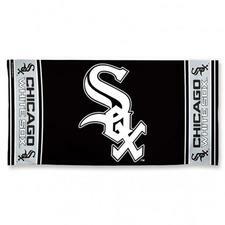 MLB Chicago White Sox - Fiber Beach Towel (Dimensions 30" x 60") - $18.95 - GolfersEdgeOnline.com - Best Golf Equipment On The Web! Our best selling towel! Great fun at 30" x 60" or 5 feet of 100% cotton enjoyment. Let's fans show their passion at the beach, on the course, in the dorm, or just when you need a big towel. Fiber reactive printed for the highest quality. If you have any more questions about the MLB Chicago White Sox - Fiber Beach Towel (Dimensions 30" x 60"); do not see the model you are looking for; need custom options; or prefer to not purchase online, then please call us at (630) 656-1291.